Step 1 Heat the oven to 350 degrees. Line a large baking pan with parchment paper and pour in the hazelnut oil. Roll the asparagus in the oil to coat well and sprinkle with 1 teaspoon salt and one-eighth teaspoon pepper, or to taste. Place the pan in the center of the oven and roast until a sharp knife easily pierces a spear, 10 to 15 minutes, tossing occasionally. Step 2 While the asparagus is roasting, place the hazelnuts in a single layer in a baking pan. Place the pan in the oven with the asparagus and toast the nuts until they are a rich brown color and are fragrant, 8 to 12 minutes. Remove the nuts and immediately pour them onto a large, damp towel. Rub the nuts with the towel to loosen and peel the skins. Coarsely chop the nuts (you can also place them in a large sealable plastic bag and pound with a mallet to break up the nuts). Step 3In a small bowl, mix together the chopped hazelnuts, currants, olive oil, vinegar, thyme, garlic and one-eighth teaspoon pepper, or to taste. Place the asparagus on a serving platter and top with the currant mixture. Serve immediately. The asparagus can be prepared up to 3 hours in advance: Cover the asparagus tightly with plastic wrap and chill, then return to the roasting pan to briefly reheat before serving. In Recipes-list.com we have selected the most viewed recipes from category - Appetizers Vegetarian . Enjoy the best recipes specially selected for you! 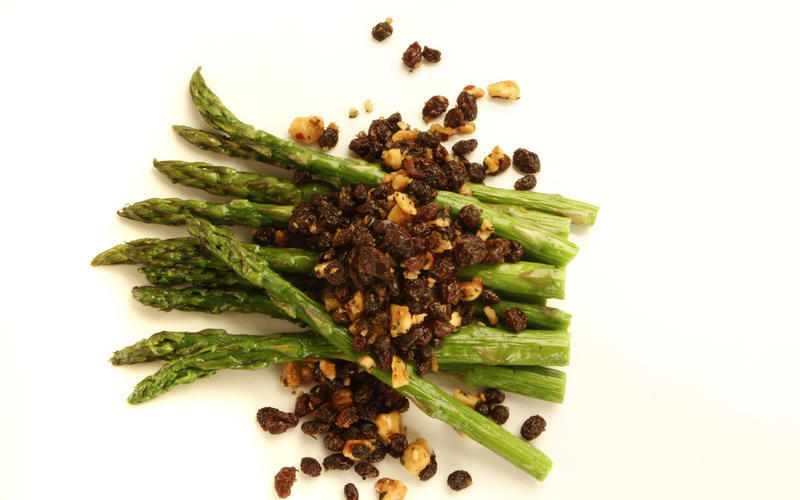 Asparagus with hazelnuts and seasoned currants is the right choice that will satisfy all your claims.